Getting Started with Strength Training - Just Move! 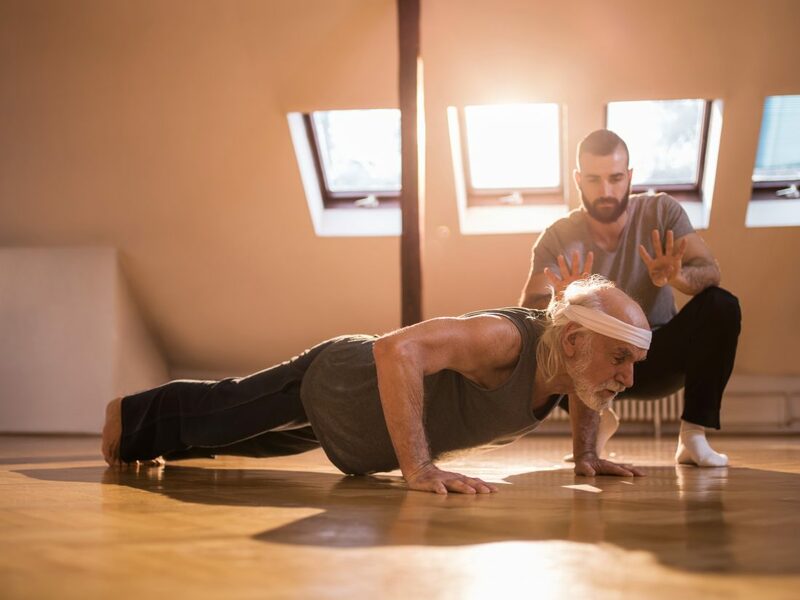 Let’s say you’ve gotten the message that strength training is even more important for those of us over 50 than it is for younger folks. You’d like to be able to keep doing things like lifting a full grocery bag or picking up your grandchild. You want sufficient core strength to help you keep from falling, and enough all-around muscle to avoid hurting yourself while lifting a box or moving a ladder. Being able to climb stairs with ease would be nice, too. So you know it makes sense to do some kind resistance training that will slow or reverse the loss of lean muscle mass that naturally occurs with age. What then? Do you begin making the rounds of all those machines at the gym, or concentrate on the dumbbell rack? Out of the dozens of machines and hundreds of exercises out there, which ones should you choose? And how much weight is enough to make a difference, but not so much as to be a strain? It’s all a little daunting. 1) Focus on a few basic whole-body exercises, like push-ups, squats, and lunges. They work multiple muscle groups at once, so they’re more efficient than muscle-isolating exercises like bicep curls. They’re also closer to the functional movements you do in your daily life. Plus you can do them anywhere, since the resistance comes from your bodyweight. 2) Use the principle of regression to match the challenge level of each exercise with your current level of strength. There are ways to make almost any whole-body exercise easier (regression), or harder (progression). At the outset, pick the hardest version you can do without strain, and with correct form, at least three or four times in a row. Then keep doing that same exercise every other day or so, allowing at least a day of recovery in between. As you get stronger, increase the number of repetitions until you can do 10 or 12 while maintaining good form. Then you’ll be ready to progress to a more challenging version. 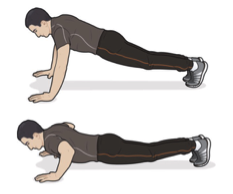 Classic version: When properly done, the push-up increases overall functional strength, and is especially beneficial for core, chest, and shoulder muscles. Start with your arms straight and your hands even with your chest and a little more than shoulder-width apart. 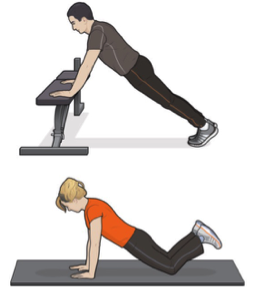 Try to lower your body to the point where your shoulder blades come together, without letting gravity take over; then push up. Keep your entire body in a straight line from your toes to your head, so your glutes and abs are fully engaged. Be sure to avoid any sagging of your midsection! Breathing is important, too: inhale as you descend, and exhale as you push up. Regression: Reduce difficulty by starting from a kneeling position, being sure to keep that nice straight line through your back and neck. If that’s still too difficult, push from a bar, a railing or a bench—even the wall, if you’re a beginner. Gradually increase the challenge by moving your feet farther from your hands.